This is another in a series of blog bursts from Alec Rawls. As this is being posted, the images are not working. They were functional in the email from Alec. Wyatt explained that without the intent of criminal negligence, criminal charges against Noriega could not be sustained. “The required aggravation … did not occur in this case,” he said. … both of Grant’s hands were behind his back, a position hands are commonly placed in by police officers in order to handcuff individuals, when the shot was fired into his body. That officer is committing a crime. … There’s no question in my mind that that’s vivid powerful evidence that he committed a vicious physical assault, unprovoked, upon a citizen, for absolutely no reason. Unless there’s something more that we don’t see, then the degree of force that was use, and the way it was used, are not justified. Officer Pirone’s lawyer Bill Rapoport told the press that a frame by frame analysis of the video shows that Pirone was responding to multiple knees to the groin by Grant, but again, our biased media is refusing to fact-check and reported on the accuracy of this easy to verify claim. All they have to do is slow down the video and take a look. Immediately before Pirone strikes Grant, Grant can be seen driving his knees up above 90° into Pirone’s groin. 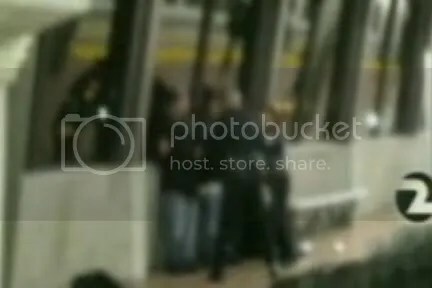 Here is a frame grab of one of the knees: 9;05 from KTVU’s raw cell phone video. Surrounding frames show the denim “7” shape in this frame to be Oscar Grant’s right knee, coming up above 90° as Grant tries to knee Pirone in the groin. Full segment here: The accusations of criminal assault by Pirone are FALSE. He was defending himself against a criminal assault, as anyone can verify just by looking. KTVU actually slowed the video down for professors Keane and Zimring, but obviously not enough. All KTVU has to do to verify the accuracy of Pirone’s claims is open up their laptop again and slow the video down a bit more, but they have yet to report this video proof that Pirone was defending himself against a vicious assault by Oscar Grant. If prosecutors claimed that frame by frame analysis showed some previously undetected evidence of police criminality, the frame by frame video would be prime time news for a week. Since it proves Pirone’s innocence, the press is not interested. Even with the murder of four policemen being justified as retaliation for the alleged criminal behavior of Mehserle and Pirone, the entire bay area media remains silent. So let’s us break the story. The innocence of Pirone and the almost certain innocence of Mehserle are major unreported news. Shout it at the top of your blogs! If we can break this story, not only might we save some lives in blue, but we can direct the resulting attention to other explosive facts that the media refuses to examine and report, like the terrorist memorial mosque now being built on the Flight 93 crash site. The Mecca-orientation of the giant crescent makes it a mihrab, the central feature around which every mosque is built. They call it a broken circle now, but the unbroken part of the circle, what symbolically remains standing in the wake of 9/11, remains exactly as it was in the original Crescent of Embrace design. It is still a giant Islamic shaped crescent, still pointing to Mecca. To join our blogbursts, just send your blog’s url. 2:282. O you who believe! When you contract a debt for a fixed period, write it down. Let a scribe write it down in justice between you. Let not the scribe refuse to write as Allâh has taught him, so let him write. Let him (the debtor) who incurs the liability dictate, and he must fear Allâh, his Lord, and diminish not anything of what he owes. But if the debtor is of poor understanding, or weak, or is unable himself to dictate, then let his guardian dictate in justice. And get two witnesses out of your own men. And if there are not two men (available), then a man and two women, such as you agree for witnesses, so that if one of them (two women) errs, the other can remind her. Women are second class citizens under Islamic law. How do religious minorities fare? The thing speaks for itself, no elaboration is required. Islam violates the concept of equality. 20.1 proscribes propaganda for war; 20.2 proscribes advocacy of incitement to hostility. How does the Qur’an fare under those standards? Those are direct commands to conduct aggressive warfare. The oral traditions of Moe’s companions give ample confirmation of that fact. Allah told the Muslims that they could go to Jihad or go to Hell. Of course, there is another side to this: the “commerce” that will save Muslims from the fire. 9:39 tells Muslims of a painful torment to befall them if they do not join the Jihad. 61:10 tells them of a “commerce” that will save them from painful torment: joining the Jihad, which will be rewarded with admission to Paradise. This carrot & stick approach is obviously incentivising Jihad. It is obvious that the Qur’an is propaganda for war, which must be prohibited. The Hilali & Khan translation has numerous related references. The Qur’an tells us that it can not be changed. The Qur’an is a violation of international law and it can’t be edited. What shall we do about it? Shari’ah clearly reflects the congruent pattern of the Qur’an & hadith. Where Allah’s writ runs, there is no freedom of religion. Where Allah’s writ does not run, it eventually will. Take note of the terminal condition for Jihad against pagans in Al – Anfal 39. The war ends when all resistance ceases and Allah has a global monopoly of faith & practice. It is obvious that war of religious compulsion and executing apostates violate the provisions of Article 18. I added bold emphasis to one clause in the ayeh and one in the hadith. Each of them is sufficient to demonstrate how Islam contravenes Article 9.1. Islamic law requires that a minimum of one military expedition be mounted against Kuffar in every year and that captive women and children are enslaved. I hope that Shari’ah is not the sort of law the authors of the ICCPR were contemplating when they wrote Article 9. 4:3. And if you fear that you shall not be able to deal justly with the orphan­girls, then marry (other) women of your choice, two or three, or four but if you fear that you shall not be able to deal justly (with them), then only one or (the captives and the slaves) that your right hands possess. That is nearer to prevent you from doing injustice. Abu Sa’id al-Khudri (Allah be pleased with him) reported: We took women captives, and we wanted to do ‘azl with them. We then asked Allah’s Messen- ger (may peace be upon him) about it, and he said to us: Verily you do it, verily you do it, verily you do it, but the soul which has to be born until the Day of judg- ment must be born. We took women captives, and we wanted to do ‘azl with them. This evidence speaks for itself, requiring no elaboration. Allah sanctions conquering people and enslaving captives. That sanction is reflected in Islamic law. The reference to azl in the hadith relates to the withdrawal method. Several related ahadith are more explicit; click the link and scroll up to read them if you want the details. While the Kingdom of Saudi Arabia officially outlawed slavery about 1964, it is still practiced with impunity. Daniel Pipes relates the details of a case of Saudis importing a slave to America in 2000.